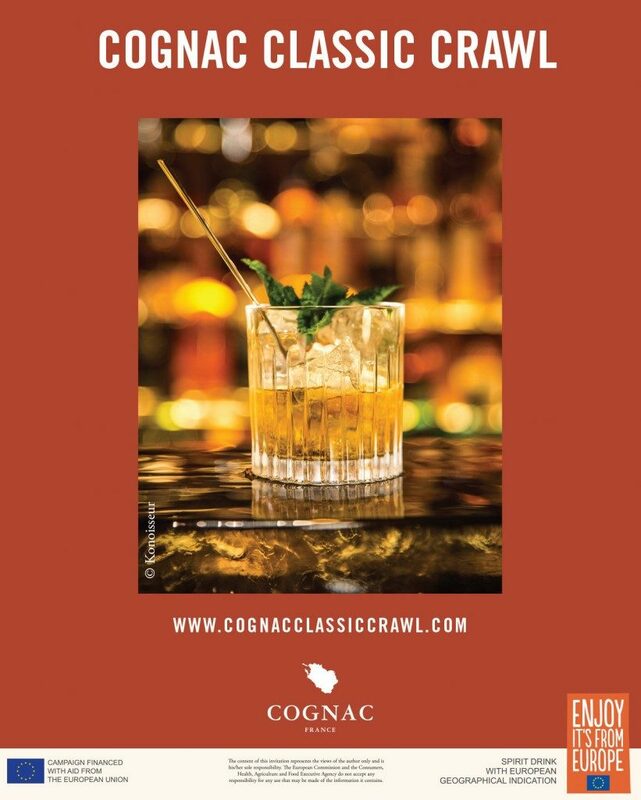 The Cognac Geographical Indication will debut its popular Cognac Classic Crawl for the first time in the Windy City and City of Angels on October 1st, 2018. Running until the end of October, this program offers cocktail lovers a taste of several classics mixed with the iconic spirit, at some of the cities’ best and most inventive bars. Produced only in southwestern France and one of the world’s most storied spirits, Cognac is the originator of many classic cocktails, such as the French 75, Sidecar and Brandy Crusta. With the purchase of a “passport,” consumers will have the opportunity to experience why cognac captivated the stirrers and shakers of the world’s first cocktail-makers in both cities. The U.S. continues to be Cognac’s top export market, with 205.9 million bottles shipped in 2017-2018. Each $30 passport gets ticket buyers one designated cognac cocktail at each bar, a custom tote bag and information on how cognac came to be the backbone of the classics. In addition, each purchaser will have the chance to win a $50 gift card from Cocktail Kingdom, to stock his or her home bars. In Chicago, 100% of ticket proceeds will go towards Inspiration Corporation. In an atmosphere of dignity and respect, Inspiration Corporation helps Chicagoans who are affected by homelessness and poverty to improve their lives and increase self-sufficiency through the provision of social services, employment training and placement, and housing. “We are so excited to partner with Cognac for this event. As an organization who helps jobless Chicagoans build careers in the culinary world, it means so much to us when other members of the hospitality industry support our students and their journeys,” says Shannon Stewart, Inspiration Corporation Executive Director & CEO. In Los Angeles, all ticket proceeds will go towards LA Kitchen. By reclaiming healthy, local food that would otherwise be discarded, training the formerly homeless, incarcerated, and foster youth for culinary jobs, and providing healthy meals to fellow Angelenos, L.A. Kitchen empowers, nourishes, and engages the community. Certified Cognac Educators—Kellie Thorn of Empire State South in Atlanta, GA and Adam Robinson of Deadshot in Portland, OR—will visit each market to train the bar staffs on Cognac and how it’s been historically used in cocktails. In 2017, the Cognac Classic Crawl took over New York City’s Lower East Side and San Francisco‘ Mission District, selling 290 tickets and raising $8,340 dollars. It will return to two new markets in 2019.